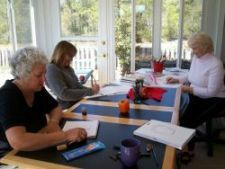 specifically to share them online with all who visit my Free Online Art Classes website. And, like my website, they are FREE to read, enjoy and share! I am also a cookbook author. You can click on the Artful Cooking button on the left to see my cookbook. But these children's stories were a lot of fun to do because I could illustrate them! I hope you enjoy them and that you are inspired to write and illustrate your own stories! 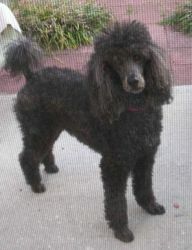 The first story, "Black Charles and Mrs. Gray,"
is actually about myself and my Standard Poodle, Charley. At age 72, I am indeed, a "Mrs. Gray." And yes, Charley does come from Florida and we did attend dog obedience, tricks training and agility classes, although, to date, Charley has not had an opportunity to accost a robber and become a hero! He IS fond of digging in the yard however, and loves to run and jump over things. If Charley could talk, he'd be saying, "It's March and who would not want to go out to the cold, windy beach? I love it! So? C'mon!" 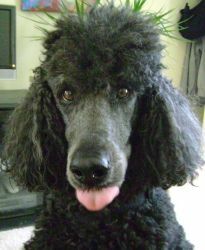 I have enjoyed and lamented the loss of three Standard poodles in my lifetime. Charley is my fourth and perhaps he and I will get old together. He is eight now and I am 72. I admire his versatility, much better than mine and appreciate is willingness to wait for me going up hills and stairs. It's February, 2013 and Charley and I went out for a walk In Carolina State Park. It was quite lovely, then it started to rain! Here in coastal North Carolina, when rain happens, it happens big! I had just had Charley groomed and his hair was cut quite short, in expectancy of Spring, which happens pretty fast around here. Happy New Year! 2012 picture of Charley, looking handsomer than ever! Hi! I'm Charley! I was just a year old when my owner, Lois, made a blog just for me! Now I'm eleven! 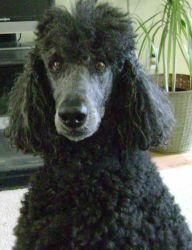 Lois says that eating healthy food and getting plenty of exercise is important, not just for Standard poodles like me, but for all dogs! Find out how I did in Obedience, Canine Good Citizen and Agility classes. I just finished the "Hollywood Stars" Tricks Training Class. That was my favorite! 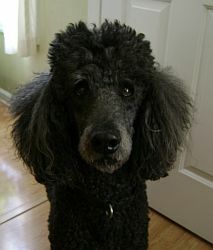 To learn more about Charley, visit his blog. Meet some of Charley's fans at this fun blog! Click here to read "Black Charles and Mrs. Gray." Didn't all of us, as children, create worlds that were full of adventure and danger? Perhaps kids these days play video games instead of spacemen and cowboys and Indians like we did long ago! But I think a child's imagination is a beautiful thing. In teaching art, I seek to keep that imaginative part in children (and adults, too) alive and productive! My second story, "When Kevin Was King,"
is about a little boy who lives in a city and create a fantasy world in the vacant lot next to his apartment house. 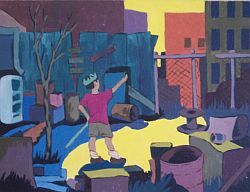 His inner-city world is his kingdom and the junk in the vacant lot turns into his treasures. Like "Black Charles And Mrs. Gray," "When Kevin Was King," is FREE for you to read, share and enjoy! Click here to read "When Kevin Was King." Here is a wonderful website that offers free kid's stories and videos, too! My good friend Georgia Mullen has written and published "A Shocking And Unnatural Incident," a most amazing book about temperance, women's rights, abolition and three girls caught up in the turmoil of the time. To see more about this book and her other book, "Wixumlee Is My Salvation" click here! John Hartung's Art That Smiles website. Brighten your day with upbeat artwork! Wonderful, awesome and humorous photos--all are available for purchase at John Hartung's website. Decorate your walls with these inspiring, uplifting photos. Give them as gifts to brighten the days of your friends and loved ones. You are the one that should be charging not the majority of other ones I have found. 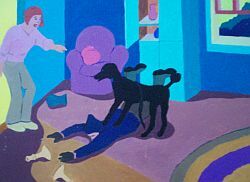 My question to you is below is a painting that I'm trying to copy, however the running bits of paint at top I'm not sure how to get that effect. I'm only on lesson one of yours as I just discovered it only hours ago. But if you would share with me how to achieve this it would be greatly appreciated.